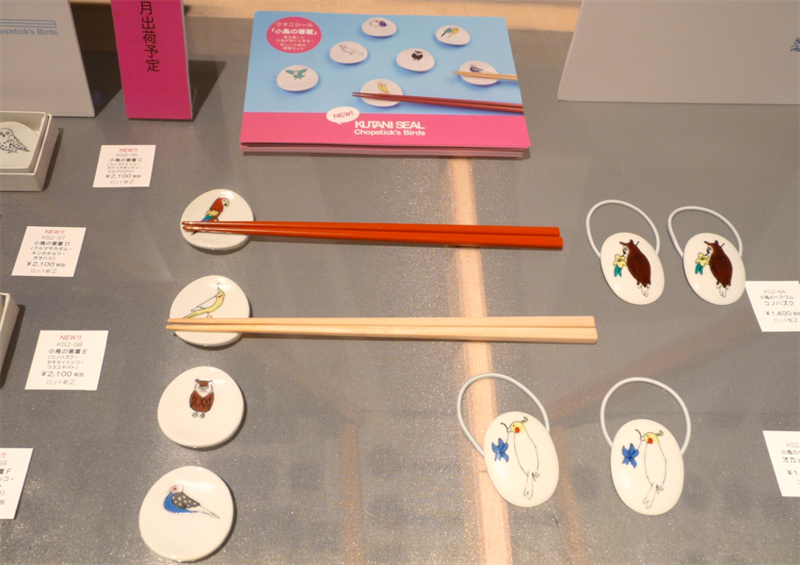 Hi everyone, do you know “Nakagawa Masashi Store” which handles wide range of household goods has a vision to “encourage Japanese crafts!”? They sell popular daily necessities and crafts that have been inherited from all over Japan and the stores are located in Tokyo, Osaka and Fukuoka. Such “Nakagawa Masashi Store” held “Dai Nippon City” from 29th to 31st August 2018. 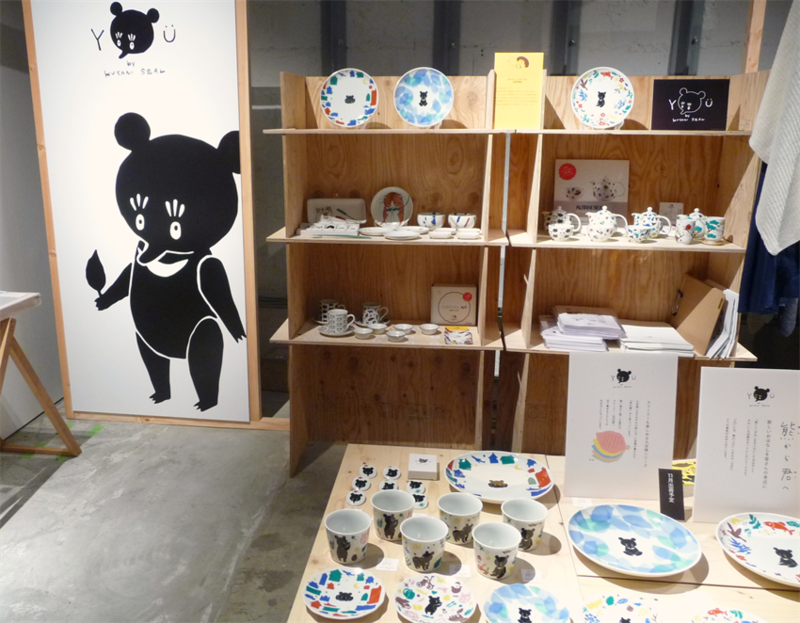 There are 46 Japanese craftsmen from all around Japan gathered together at Terada Warehouse in Tennozu, Tokyo, and it was filled with a collection of gems like Japanese craftsmen and creative stuffs! Approximately 1,700 people visited this year and it was a great success compare to last year. 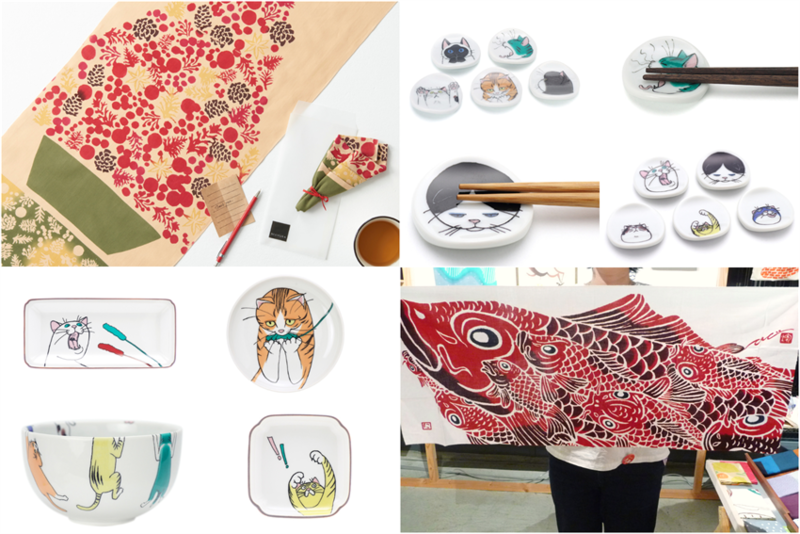 Out of 46 craftsmen, this time we will introduce dyed products from Sakai City, Osaka and Kutani ware, Ishikawa prefecture. A Souvenir from Japan recommended for those who think “slightly different from other people”! 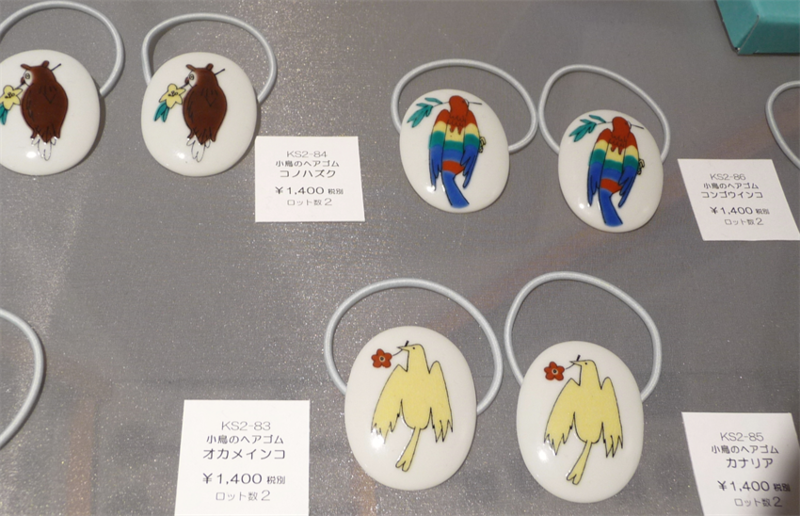 Pottery made in the southern part of Ishikawa Prefecture of Hokuriku region, Japan – Kutani ware. It is famous as a high-class dish which was drawn in black and five color paints of "red · yellow · green · purple · navy blue" coloring method was thickly painted on the dish. Originally the craftsman draws with a brush, but for mass production, there is a transfer seal technology that sticks the printed pattern to the vessel like a seal. 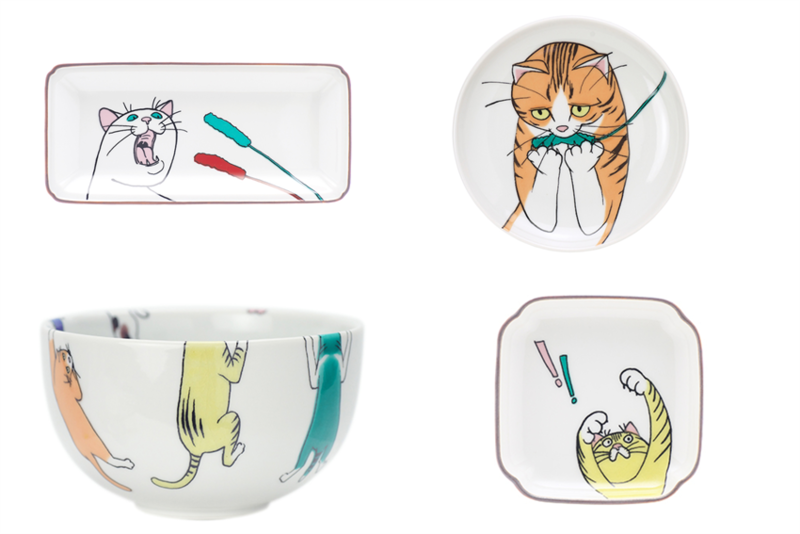 This time, KUTANSEAL sells Kutani Ware using its transfer seal technology, with the thought that "We want Kutani ware to feel more familiar." 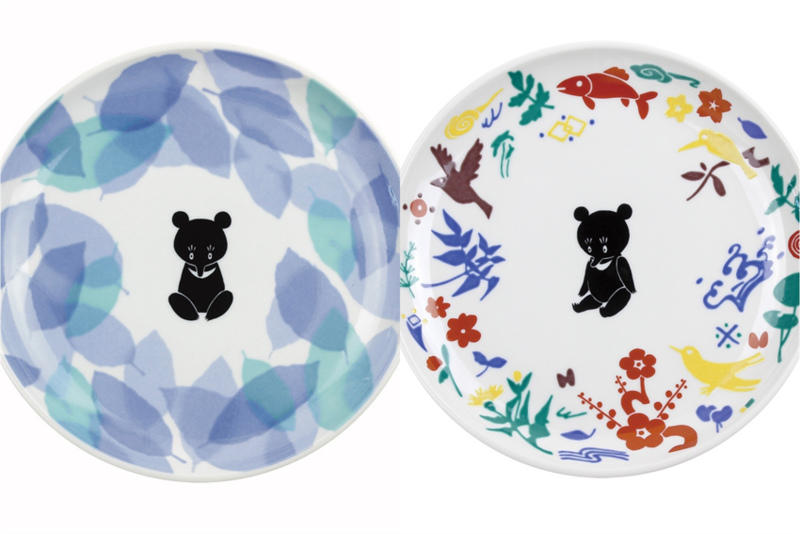 A series of motifs with black bears to be released from November 2018, a scene from a picture book is drawn for each dish, and it is a story when all is complete. 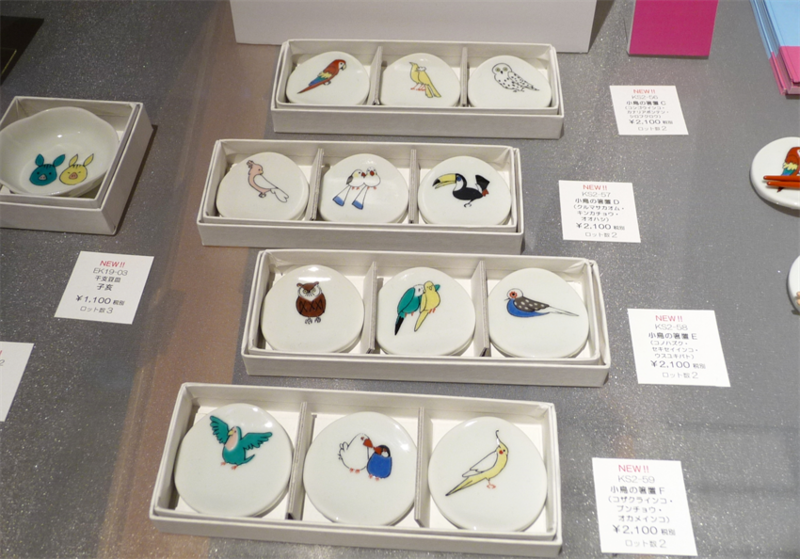 For round dishes, 12cm 2200Yen, 22cm 5000Yen, soba soup cup 2300Yen and broaches 1300Yen (all exclude tax). 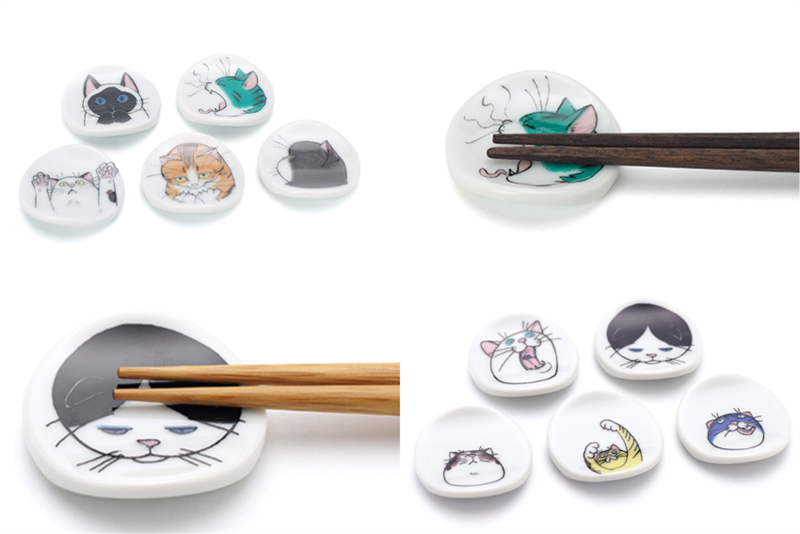 Besides, people who use it will be astounded when these fun items are aligned such as “little bird chopstick holder” where as if the birds are resting on branches when the chopsticks are put on it and “Cat Jealousy” series which is playful cats drawing. 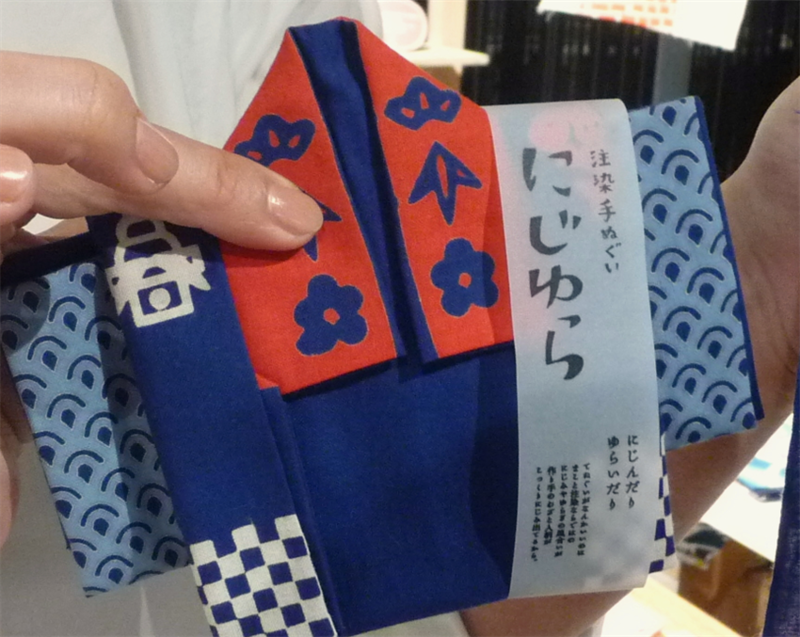 It is recommended as a souvenir for yourself or friends when you visit Japan. In addition, Shibuya Loft, Yurakucho Loft, Nakagawa Masashichi Shoten Rukua Osaka Store, Umeda Loft Variety 2, etc. 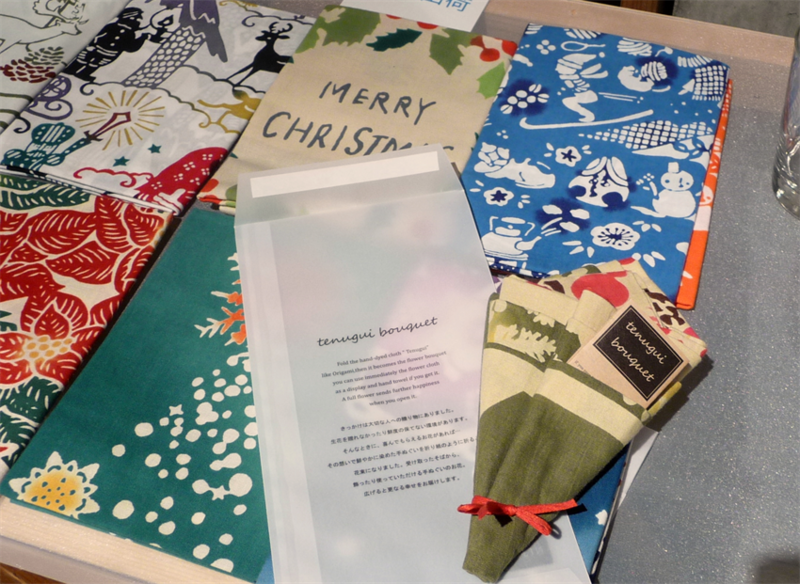 [Hand towel bouquet] 1,800Yen (tax excluded), it is a Christmas tree when you open up. Besides Christmas tree, hydrangea, sunflower and mimosa are also available. This dyeing technique/injection dyeing is originated from Sakai city, Osaka during Meiji Era. A fabric of about 20m is laid in a bellow shape, and after applying bank with glue so that no dye flows out to the plain portion, the dye is poured into it. Originally, yarn dyeing is to dye one by one, but with casting, there are features that you can dye about 25 towels at a time. Even it is about charm or others, the appearance on each piece is different. Due to the nature of dyeing, unlike uniform prints, "blemishes" are born, the same thing does not exist in others and thus, it becomes a unique soft texture. You can feel the warmth as it is hand-crafted by craftsman. Hand towel is a plain weave cloth made of cotton used mainly for wiping hands and face. 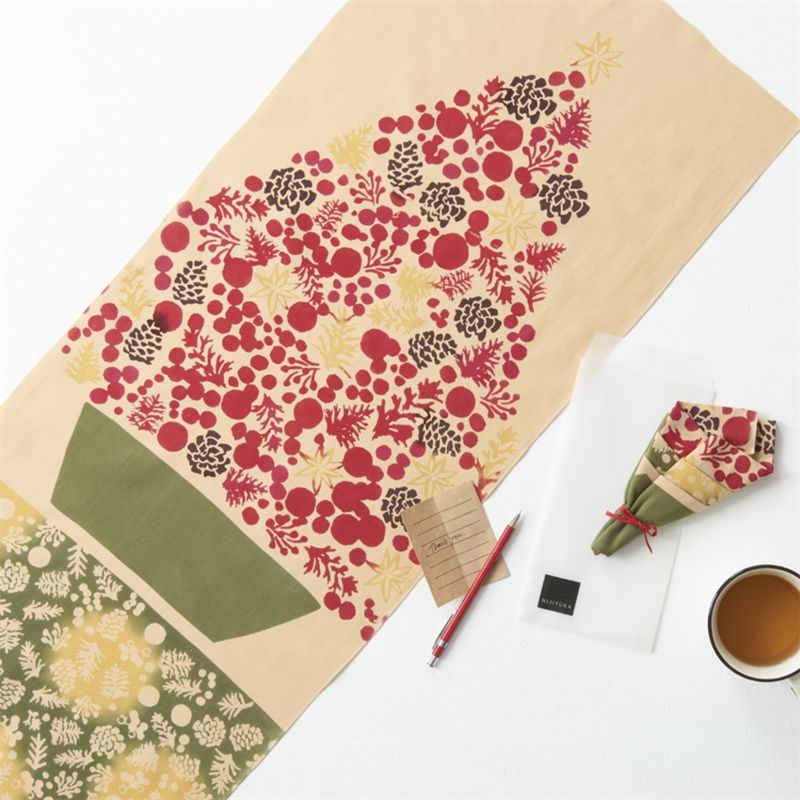 It is said that it was a necessity for daily life in the Edo period due to the fact that the cloth takes up less space because it is thin and dries quickly. It is not only use as "wipes" but also a great use as a luncheon mat, tapestry, scarf and bandana. 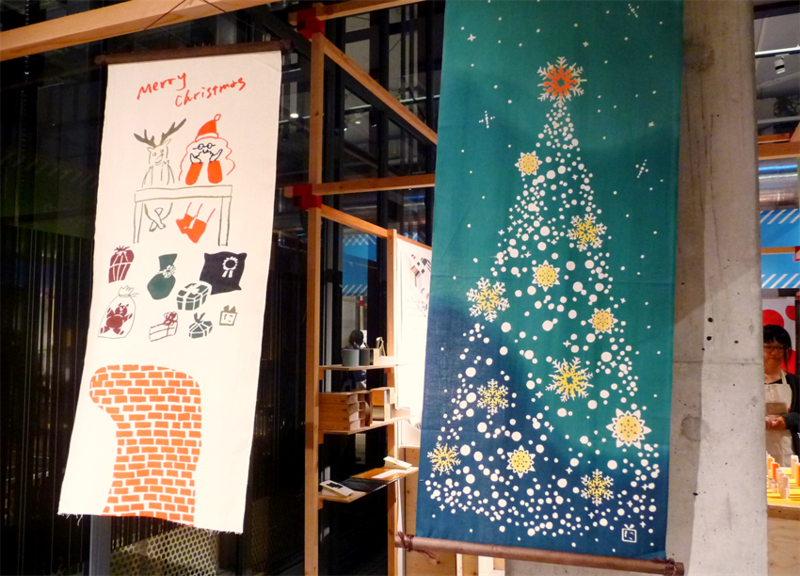 In "Nijiyura" which convey towel by such injection, they sell towels that convey the goodness of injection dyeing with themes such as animals, plants and musical instruments. 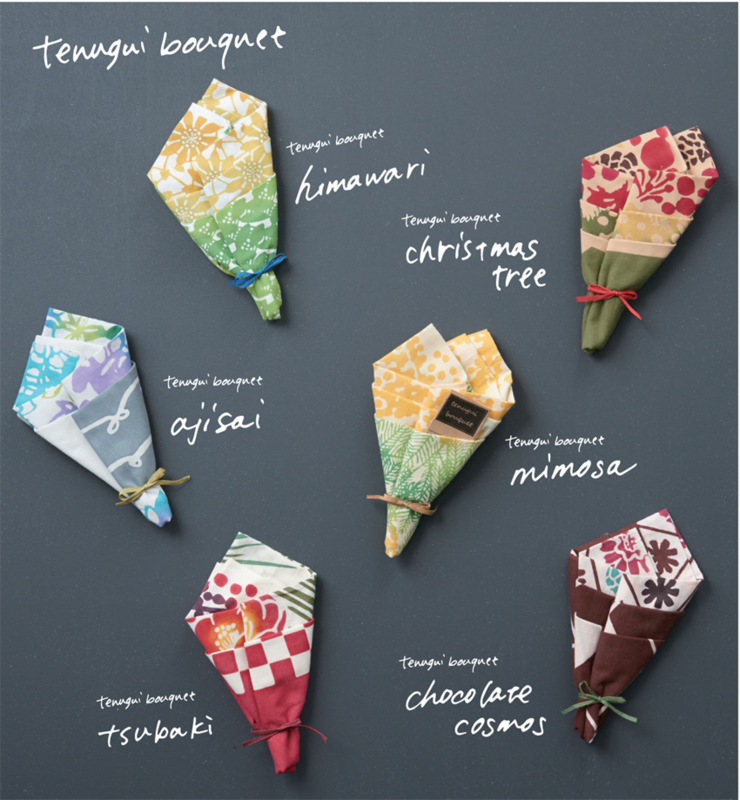 Especially recommended one is "Happi coat folding Tenugui New Year". Mount Fuji is drawn, and when folded it is in the shape of livery coat. 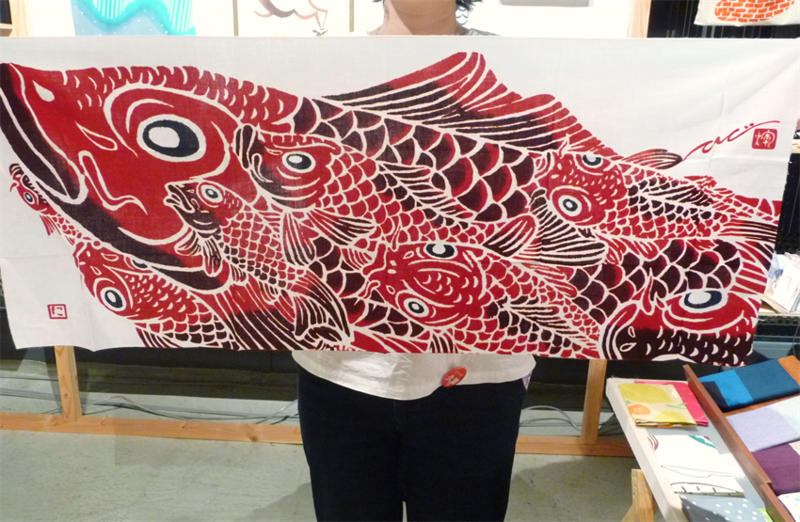 Besides based on the deep green color, "Hand towel Sacred Night" where Christmas trees and blinking stars were drawn and "Hand towel Carp is dragon in heaven" in which a powerful carp that is about to start moving is drawn, thus it feels as though you are coming to a painting exhibition. 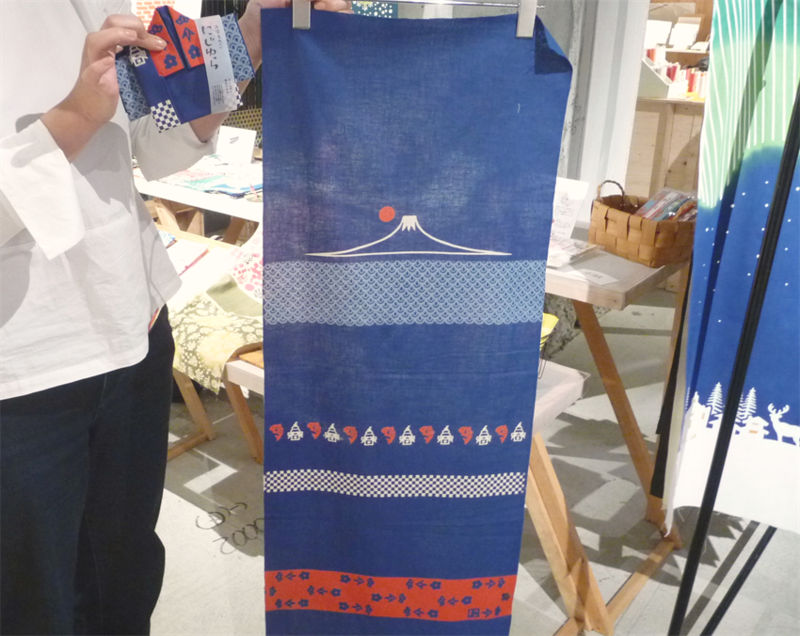 The size of the hand towel is about 37cm width, 90cm in length and the fabric is 100% cotton. They also sell sticks 900Yen (excluding tax) for tapestry separately. In addition, “hand towel bouquet” was invented "for those who cannot send flowers even though they want to", so it is folded in the form of a bouquet and it is a towel drawn with flowers when open up. It is a masterpiece filled with surprises. In addition, there are many other goods such as folding fan, book cover, brooches and so on. Both the hand towel and the Japanese general merchandise are light and compact, so it is also a good reason to easily put into a suitcase. 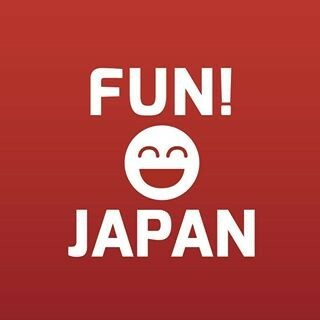 Please buy it as a souvenir when you visit Japan!